Tai Chi training is designed to enhance and regulate the functional activities of the body through regulated breathing, mindful concentration, and gentle movements. It includes balance training and has been shown to improve balance and coordination. Because it is not strenuous, involving slow gentle movements, and is safe, having no appreciable side effects, it is appropriate for an elderly population. Indeed, Tai Chi and Qigong have been shown to be beneficial in slowing or delaying physical and mental decline with aging and to increase brain matter in the elderly. In today’s Research News article “Tai Chi Improves Brain Metabolism and Muscle Energetics in Older Adults.” (See summary below or view the full text of the study at: https://www.ncbi.nlm.nih.gov/pmc/articles/PMC6055800/ ), Zhou and colleagues recruited healthy older people (>55 years of age) and trained them in Tai Chi practice with a one hour, twice a week, for 12 weeks instruction. They were measured before and after training for leg strength while having their brains scanned for metabolites with Magnetic Resonance Imaging (MRI). 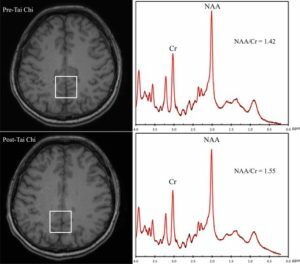 N‐acetylaspartate (NAA) is a neuronal marker of neuronal health. They also measured the rate of recovery of phosphocreatine (PCr) in the leg following exercise, a marker of muscular fitness. They found that after training there was a significant increase in N‐acetylaspartate (NAA). NAA is a marker of the number of neurons present in the brain. Hence it’s increase in this study suggests that Tai Chi training increases the number of brain cells in the elderly. This further suggests that Tai Chi training is neuroprotective and may reduce the degeneration of the brain that occurs in normal aging. They also found that after training there was a significant decrease in the rate of recovery of phosphocreatine (PCr) in the leg following exercise. A PCr decrease indicates that the capacity of muscles to use oxygen has increased. This, then, is a measure of muscular fitness. Hence it’s decrease in this study suggests that Tai Chi training improves exercise fitness in older adults helping to counter the age related decline in strength. These results suggest the biochemical mechanisms that may underlie the ability of Tai Chi training to slow or delay physical and mental decline and to increase brain matter. These results not only further support the benefits of Tai Chi training for aging adults but also indicate how this training may change the chemistry of the brain and muscles to counter the effects of aging. So, improve brain metabolism and muscle energetics in older adults with Tai Chi. Tai Chi is a mind‐body exercise that has been shown to improve both mental and physical health. As a result, recent literature suggests the use of Tai Chi to treat both physical and psychological disorders. However, the underlying physiological changes have not been characterized. The aim of this pilot study is to assess the changes in brain metabolites and muscle energetics after Tai Chi training in an aging population using a combined brain‐muscle magnetic resonance spectroscopy (MRS) examination. Six healthy older adults were prospectively recruited and enrolled into a 12‐week Tai Chi program. 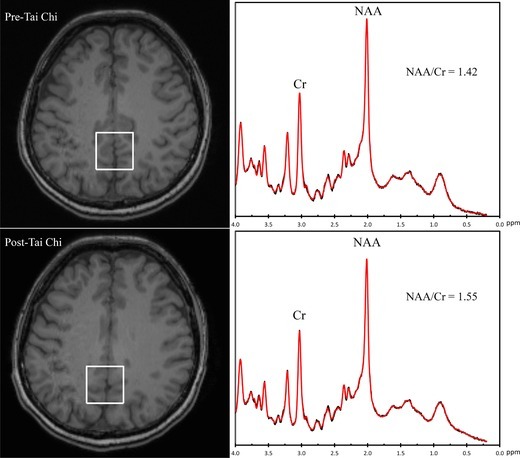 A brain 1H MRS and a muscle 31P MRS were scanned before and after the training, and postprocessed to measure N‐acetylaspartate to creatine (NAA/Cr) ratios and phosphocreatine (PCr) recovery time. Wilcoxon‐signed rank tests were utilized to assess the differences between pre‐ and post‐Tai Chi training. A significant within‐subject increase in both the NAA/Cr ratios (P = .046) and the PCr recovery time (P =.046) was observed between the baseline and the posttraining scans. The median percentage changes were 5.38% and 16.51% for NAA/Cr and PCr recovery time, respectively. Our pilot study demonstrates significant increase of NAA/Cr ratios in posterior cingulate gyrus and significantly improved PCr recovery time in leg muscles in older adults following short‐term Tai Chi training, and thus provides insight into the beneficial mechanisms.